It exclusively relies on sources of whey protein. Whey protein is a fast absorbing protein source containing all the essential amino acids you need to build and maintain muscles. The product is low in sugars and is an excellent selection for all athletes who take great care of their nutritional intake. 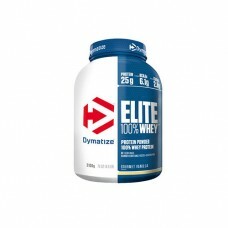 This makes Elite 100% Whey to an ideal choice after your workout or in between meals. Whey protein concentrate (milk) (93%), bulking agent (polydextrose), emulsifier (soy lecithin), salt, hydrolized whey protein concentrate (milk) (0,5%), whey protein isolate (milk) (0,5%), flavouring, thickeners (carboxymethylcellulose, xanthan gum, carrageenan), flavour enhancer (potassium chloride), sweeteners (sucralose, steviol glycosides, acesulfame K). Mixing instructions: Add approx. 2 scoops (included) to 180-240 ml (6-8 oz) of water, milk or a drink of your choice and mix thoroughly. Mixing instructions: Add approx. 2 scoops (included) to 240 ml (8 oz) of water, milk or a drink of your choice and mix thoroughly.